Residential burglary is defined as the unlawful entry of a residential structure with the intent to commit a crime, usually a theft. 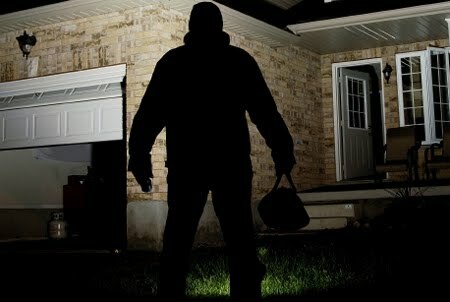 Although burglary is a non-confrontational property crime that is usually committed when the offender thinks no one is home, it can leave a victim feeling vulnerable and violated. Prevention is the goal when it comes to burglaries and residents can have a significant impact on reducing the opportunities for residential burglaries to occur. Burglars may operate alone, in pairs or as part of an organized group or gang. Most burglars are motivated by the need to obtain quick cash. They tend to target property that is portable, valuable, and can easily be converted to cash or readily exchanged for drugs. Items frequently stolen include cell phones, laptops, tablets and gaming consoles. Most of these items can be easily transported out of the house with a back pack. Why was my house burglarized? Burglars tend to commit this crime in neighborhoods which are familiar to them. Burglars target multiple homes in a specific geographic area once they have successfully broken into one residence in that area. Houses that have overgrown shrubs, trees or architectural features which hide windows and doors also make easier targets. Once a house has been burglarized it is more likely to be burglarized again, unless the owner / resident changes the environment. Burglars may return to houses for items they did not have time to take during the first burglary. They also tell other individuals about desirable houses. Most residential burglaries occur during the daytime when residents are out of the house at work or school. Most burglars avoid homes which appear occupied. An occupied home will have the lights on, a vehicle in the driveway, visible activity, or audible noises from within. It is very common for burglars to go door to door in a neighborhood and ring a doorbell or knock on a door to confirm whether or not someone is home. If someone answers the door, they say that it is a mistake and they are looking for a particular individual or a nearby address. Your home will be more vulnerable if it is vacant for extended periods of time. Signs of vacancy such as accumulated mail or newspapers and an overgrown lawn may indicate that no one is home. Maintenance of low hanging trees, thick shrubs and other landscaping which could obscure views of windows and doors will increase natural surveillance of the property by other neighbors. If a residence is set back from the road make sure the dense landscaping is kept trim so as to provide some visibility of the property for pedestrians and police conducting neighborhood patrols. The installation of good lighting around entry ways can increase the chance of a burglar being seen by neighbors. Lights should not be pointed in the direction of your neighbor but rather pointed in the direction of what you are trying to protect, such as your doors and windows. Consider installing a surveillance system. Never leaves house keys under a door mat or in a flower pot. Remove keys and garage door openers from your vehicles, especially those parked outside. Do not include your address on your keys. Lock doors and windows, including garage doors. This includes the door to your attached garage. During summer months, use secondary locks to secure windows in unattended rooms. Talk to your children about the importance of locking up. A properly installed alarm system, which is regularly used. Consider upgrading the security hardware of your home to fortify entry points. Keep an inventory of your valuables and be sure to include serial numbers, description, make and model, and fair market value of your items. Take pictures of jewelry and artwork. Call 9-1-1 to report a crime in progress, do not enter the residence. If the residential burglary has already occurred call the non-emergency number at 410-548-3165 and do not enter the residence. In the event that you observed the suspects, write down a description of the person, license place of the car the person might be operating, and direction of travel. Do this while the details are fresh in your memory. Talk to your neighbors about what happened. It is important to share information with others so they are aware of any criminal activity in the area. The officer can provide you with a case number at the time of the report. If you don’t receive a case number, call Salisbury Police Records Division at 410-548-3165. Call the Salisbury Police Records Division to obtain copies of the report by calling 410-548-3165. If you discover additional items were stolen you will need relevant information to establish ownership, such as serial numbers, receipts, etc. This information can be added to the original report via the case number.